Around 1220, Alexander de Gloucester undertook major alterations to what had previously been a stone house, inhabited ca.1174 by Godwin Grom and Gerald the tanner, then by wealthy minter Lambin Frese, next by Adam de Charing, and later (from 1207) by Lambin's son. Alexander converted it into an almshouse, dedicated to the Virgin Mary, for looking after poor or elderly priests. The former residence served as the hall, where the priests lived, ate and slept, around a central hearth; this is the left-hand section in the photo above. A solar and undercroft  the central portion of the building in the photo  was added ca.1373, the solar serving as the private room of the master of the hospital. Not seen in the photo is a section to left of the hall, where the hospital servants lived and worked, with kitchen, pantry and buttery. The chapel of St. Mary was built at right angles to the main building, with a kitchen at its rear. The chimney stack is of course a later addition, as are the windows, added when the chapel open to the roof was divided by adding two upper floors; an upper floor was added to the great hall at the same time. 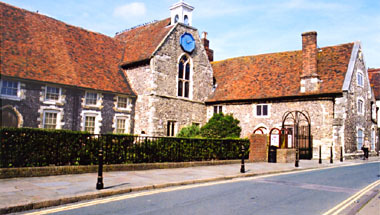 The hospital ceased to have a religious function in 1575. 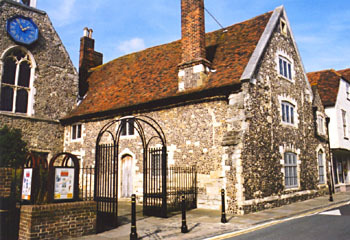 In post-medieval times the building was converted to secular uses, such as school, poorhouse, workhouse, and clinic; in the 1980s it was turned into a museum of local history, many surviving medieval features  such as the crown-post roof support structure  being restored to view in the process.